I wish goodreads' reviewing scale would allow increments between whole numbers. This book is a solid 4.5, maybe a even a 4.6. The story unfolds quietly and is presented in a detached manner, almost reminding one of the old Dragnet shows where Joe Friday asks for, "Just the facts, ma'am, just the facts." The clues are all there for reader - not laid out on the table but voiced as almost an afterthought. Loreticus brilliantly draws the shards of information together like pieces of a puzzle until the whole picture appears for all to see.This book is very different from others in the mystery genre. Everything, including the resolution, is subtle and low-key. A quick read, the reader is the shadow in the back of room, on the sidelines, always watching but not a part of the scene. The Inconvenient Murder(Disclaimer: I was provided a copy of the book in exchange for my honest review.) Convenient Murder by J. B. Lucas, a historical murder mystery that loosely uses the Roman Empire as its backdrop lends itself quite nicely to the author’s apt ability for character and world building. The book, a novella, is a quick read that you can complete in one sitting. While the main character and his sidekick attempt to solve the murder there are plenty of twists and turns, intrigue, and colluding. I found the humor and satire a nice bonus. All in all the Convenient Murder stretched the imagination by bringing together the old world with the contemporary. 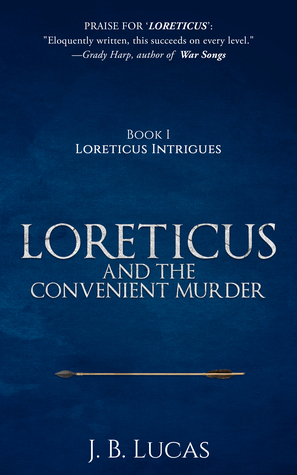 I RECOMMEND READING Loreticus And The Convenient Murder, Book I of Loreticus Intrigues. –Tex. Loretucus, the spy master, has gone to his hometown, Lores because of difficulty with General Claisan. One if Claisan's men has settled in Lores. He is murdered and Loreticus and his friend,Selban, are suspected. They must find the murderer before Claisan finds them. J. B. Lucas has drawn the characters well and written an interesting plot. I recommend this book. Think Lord Peter Whimsy, but set north of Rome in 255. Easily read in one sitting, quite a nice puzzle.I read a free copy and this voluntary review is my own opinion. It felt like stepping back in time. Definitely intriguing! Wow! In just a few chapters (only 6), the author managed to give a just enough solid background, create a mystery and question, connect a murder to that mystery and question, relate the steps taken to investigate it and finally to solve the mystery and murder, plus the reader is left with the feeling that this story is just the beginning for Loreticus, the imperial spymaster and his retired rakehell flaky (as in snowy dandruff~ed) friend with the yellow teeth, Selban.